MUMBAI: Percept Live, the creators of Sunburn, Asia’s biggest music festival, bought down the legendary ‘Boyzlife’ under their Live Intellectual Property, ‘FLY’ which witnessed a floating crowd of 4000 enthusiasts in Mumbai and Bengaluru. Westlife’s Brian McFadden and Boyzone’s Keith Duffy joined forces to create ‘Boyzone’ that made its successful debut performance in India. The legendary and talented artists performed many of their chartbusters including Westlife’s hits Swear It Again, Queen of My Heart, I Have a Dream, Uptown Girl, You Needed Me, and BoyzLife smash hits such as No Matter What, I Love the Way You Love Me, Words, Baby Can I Hold You and Love Me for a Reason. Fans across Mumbai and Bengaluru had a blast as they swayed to the evergreen melodies of Brian and Keith. As the party progressed, guests were seen in high spirits, dancing to the music as also enjoying the specially curated F&B experience. With amazing SFX and state-of-the-art technology, Percept Live ensured that guests enjoyed a larger than life experience and walked away with amazing memories of the ‘FLY’ Music Festival. 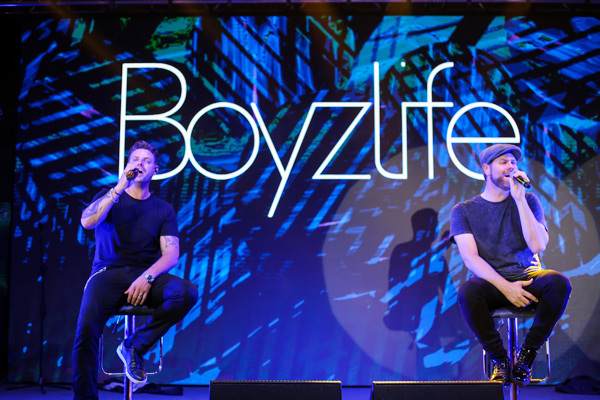 The Boyzlife show has already been performed for over 20,000 adoring fans since the pair came together in 2016, and this was their debut performance in India. With Westlife, Brian McFadden enjoyed 12 UK and Ireland number one hits whilst with Boyzone’s Keith Duffy enjoyed similar success with five at number one albums that sold over 25 million copies worldwide.